A critical piece in maintaining, preserving and enhancing the Canadian system of justice is educating the public. This is also one of the objectives of the Association. Ensuring that Canadians understand what to expect and how the system functions helps to promote effective and timely access to justice for all. The educational video Judges in Canada – What they do and how they do it is aimed at new and young Canadians as well as the public in general. 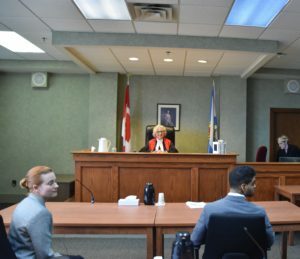 The video illustrates what they are entitled to expect from Judges in Canadian Courts and covers principles fundamental to our Justice System; concepts such as Judicial independence and the Rule of Law. Educational messages are embedded in our story about a young man, Weldon, who, while returning his child to her mother, becomes involved in a car accident. This results in criminal charges. The child’s mother then applies to the Family Court to seek restrictions on his contact with his child. Our narrator, The Honorable Judge Samuel Moreau of the Provincial Court of Nova Scotia, walks the viewer through our young man’s story. 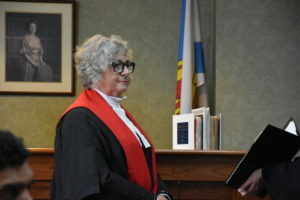 In a courtroom scene, the Honorable Justice Deborah Gass of the Supreme Court of Nova Scotia (Family Division) addresses Weldon’s fear about discrimination within the Justice System. The video identifies the citizen’s legal entitlement to a fair hearing according to the evidence and the law regardless of age, race, religion, sexual orientation or cultural origin. Try Judging is another tool aimed at youth to educate on the role of judges in our justice system. It is an interactive case study placing the student in the middle of the courtroom and in the judges shoes. It explores important concepts such as the rule of law, judicial independence and judicial impartiality through five case scenarios.